Terra cotta statuettes sprouting into fuzzy green pets?! What’s not to love? Of course if you’re not into the responsibility of having to care for a Chia lamb, Chia Hello Kitty, Chia Scooby or even Chia Obama, you can always jump on the chia seed healthy bandwagon instead. Since they’re bountiful in Omega-3s, fiber, antioxidants and all that jazz, I like to sprinkle chia seeds into my morning smoothies, muffin batters, or over greek yogurt. And since they take on somewhat of a “gel-like” consistency when mixed into water, they’re the perfect little ingredient to make a cheat pudding with. There are so many variations on Chia Seed Puddings out there but I like to keep things simple with just a few ingredients: ripe bananas, almond milk, agave or honey, a dash of vanilla and of course–chia seeds. The actually consistency after it sets is like tapioca pudding and is delish when topped with fresh fruits, nuts or even granola. And if you really want to get a little crazy, add a bit of cocoa powder to the party for a Chocolate Chia Seed Pudding. Because chocolate makes EVERYTHING better! In a blender, add the bananas, almond milk, agave and vanilla extract. Puree until smooth and then transfer to a resealable container. Stir in the chia seeds and cover. Refrigerate the mixture for 4-6 hours, or overnight. Spoon the pudding into two cups and top with fresh mango slices. Serve chilled. Previous Post Valentine’s Rice Cereal Pops…Because I Heart You. 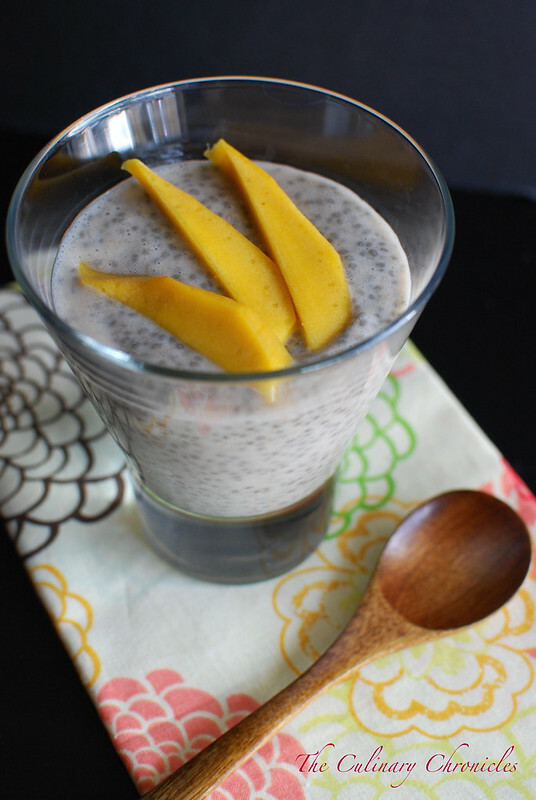 I would really love to have a go at making chia seed pudding … it’s incredible how it pretty much makes itself! I bet it’s lovely with banana and mango!